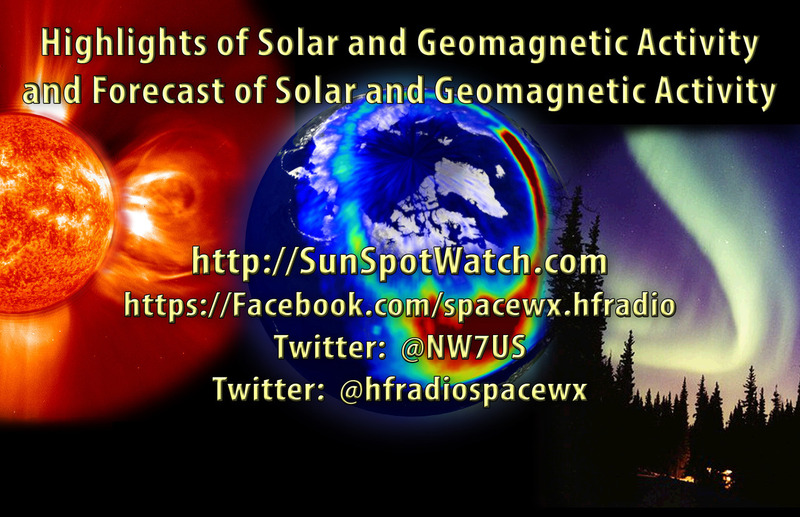 Here is this week’s space weather and geophysical report, issued 2019 Apr 08 1120 UTC. Solar activity was very low throughout the period. Region 2737 (N12, L=63, class/area-Cao/40 on 02 Apr) was inactive before decaying to plage on 04 April. Region 2738 (N06, L=298, class/area-Hsx/300 on 07 Apr) produced low level B-class activity after rotating around the east limb. No Earth-directed coronal mass ejections (CMEs) were observed. The greater than 2 MeV electron flux at geosynchronous orbit reached high levels on 05-07 April with moderate levels observed throughout the remainder of the reporting period. Geomagnetic field activity reached active levels on 01 and 03 April with unsettled levels on 02, 04-06 April due to coronal hole high-speed stream (CH HSS) influence. Quiet conditions were observed on 07 April. Solar activity is expected to be at very low to low levels throughout the outlook period. The greater than 2 MeV electron flux at geosynchronous orbit is expected to reach high levels on 08-12 April and 02-04 May with normal to moderate levels expected throughout the remainder of the outlook period. Geomagnetic field activity is expected to reach unsettled levels on 24-25, 27-28, 30 April and 01-02 May. Quiet conditions are expected throughout the remainder of the outlook period.